A cold sandwich is my go-to lunch choice in the summertime, and this week I decided to try a new spread from a unique tea room cookbook I found. This booklet is titled "The Sheep and The Crown Tea Room: Tea & Reception Recipes," and it's by the Episcopal Church of the Good Shepherd in Venice, Fla., dated 1999. I imagine this is one of those churches that hosts a "tea room" for special events once a year or so, as I've heard they do this sort of thing in Charleston as well. 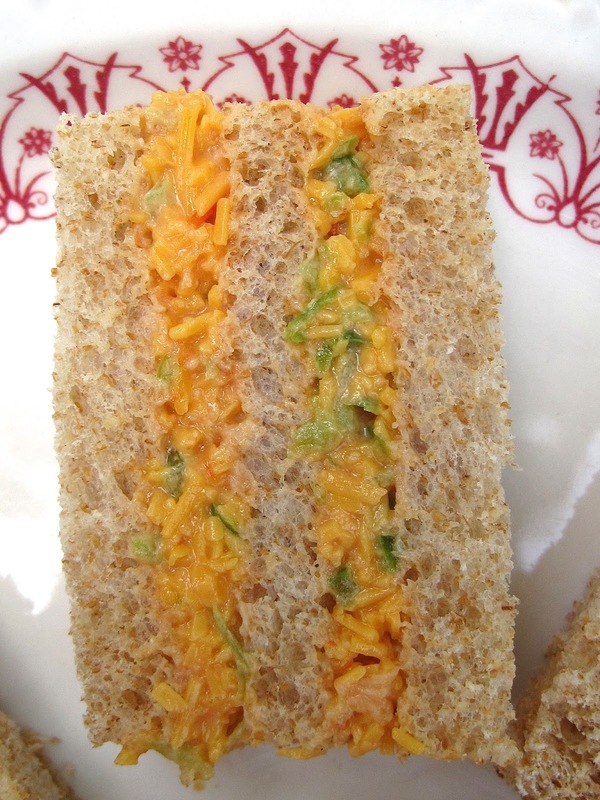 The recipe I chose was the one for their Piquant Cheese Sandwiches, which taste very much like a sweeter version of pimiento cheese sandwiches but without the pimiento. 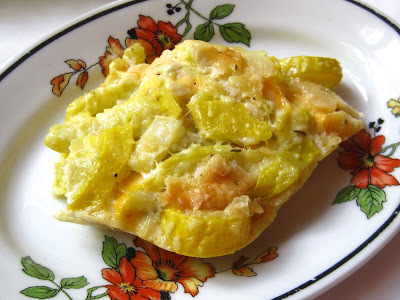 It couldn't have been easier to make, and this is definitely a recipe I'll be making again! 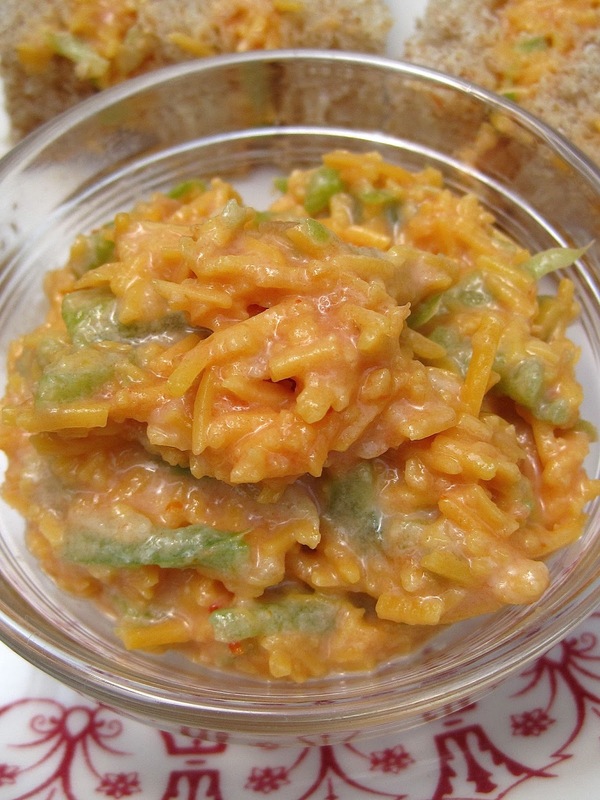 Grate cheese in a medium bowl and add other ingredients. Combine well. Makes 40-80 sandwiches, depending on the size. Note: I halved this recipe since I was only making it for me and my husband, and we ate on it for days! Also, since I was halving it I didn't want to waste buying a red pepper so I used all green pepper in my version. I thought the spread looked pretty made into ribbon sandwiches! I do not, as a rule, allow myself to stockpile fancy bath soaps. It seems to me the fragrance evaporates a bit after a while, so when I open a new bar I want it to be as fresh smelling as possible. 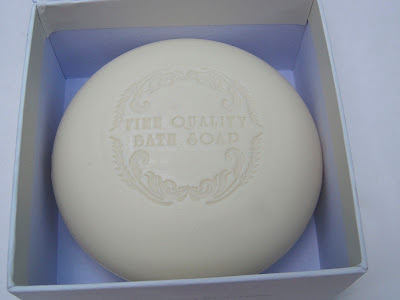 But sometimes one actually *needs* a new bar of soap, doesn't one? 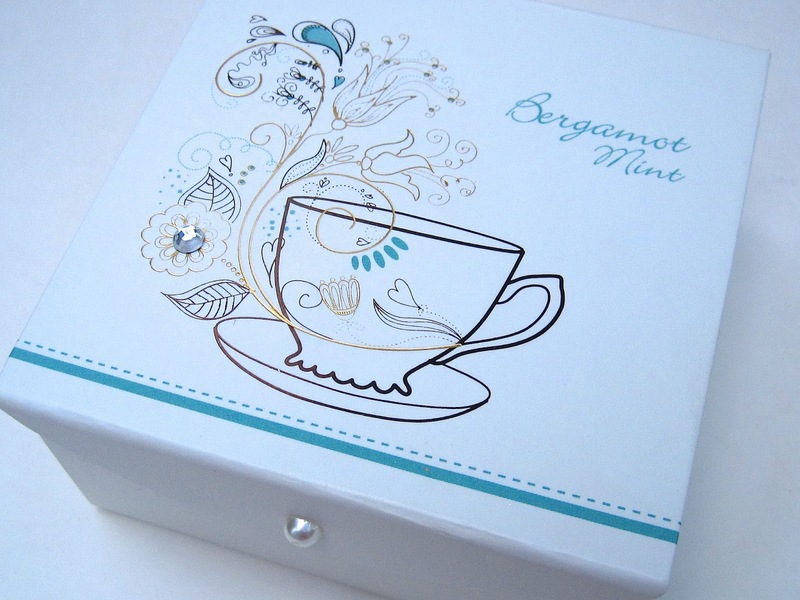 Well, at T.J. Maxx recently, I was soap shopping and came across a new variety that was definitely calling my name, this Bergamot Mint soap in a super cute box! The manufacturer is listed as CST in Fall River, Mass., and a little cyber-snooping reveals the CST stands for Commonwealth Soap & Toiletries. (Nice name. Why do you reckon they don't capitalize on it?) This soap has a fresh, strong mint scent, and as a "not-a-morning-person" kind of person, I like a zippy scent to help me wake up in the shower. And this time, when the soap is gone I'll have a fun box to use later as well! 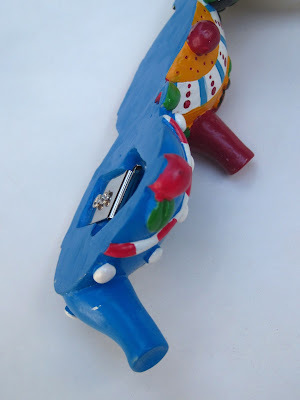 Preview: Friends, you do NOT want to miss Monday's post! I am thrilled to have a very special guest on the blog that day, and she has generously offered to provide a fabulous giveaway for one lucky winner! 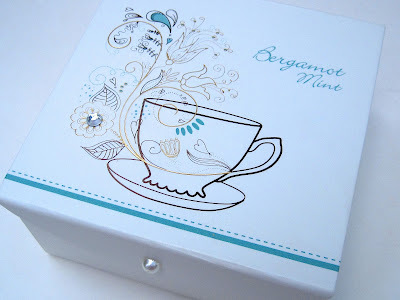 When my friend Susan gave me this tea chest last month I was most grateful for the chest itself, but one day I happened to notice the teas are a brand I don't believe I've tried before, Touch Organic. Clearly, a tasting was in order! 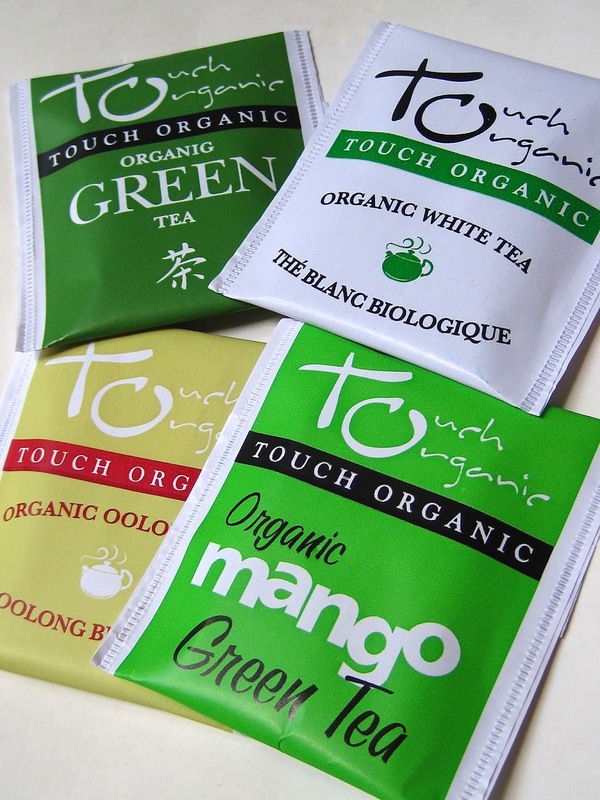 The four Touch Organic teas in the chest are a green, white, oolong and a mango-flavored green. The Organic Green tea was a nice tea I steeped for just about two minutes or so. It was smooth tasting and had no bitterness at all! 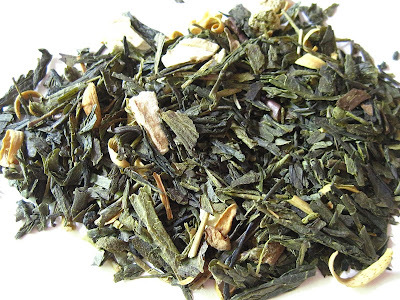 White teas sometimes taste wimpy to me, but the Organic White had a lovely flavor, a little on the woodsy side, and the Organic Oolong had a very strong scent and taste of that woodsy flavor I love, that scent which reminds me of woodchips. The Mango Green was pleasantly fruity, and though I steeped it for fully three minutes it didn't have that grassy taste some greens can have. 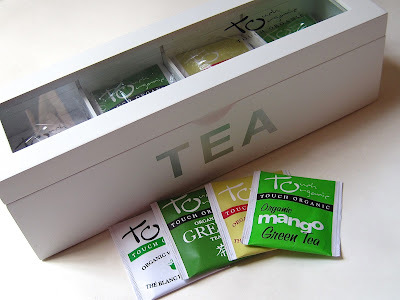 I was very pleased with my new Touch Organic teas, and I was happy to see that individual boxes of them are now for sale at the local T.J. Maxx. 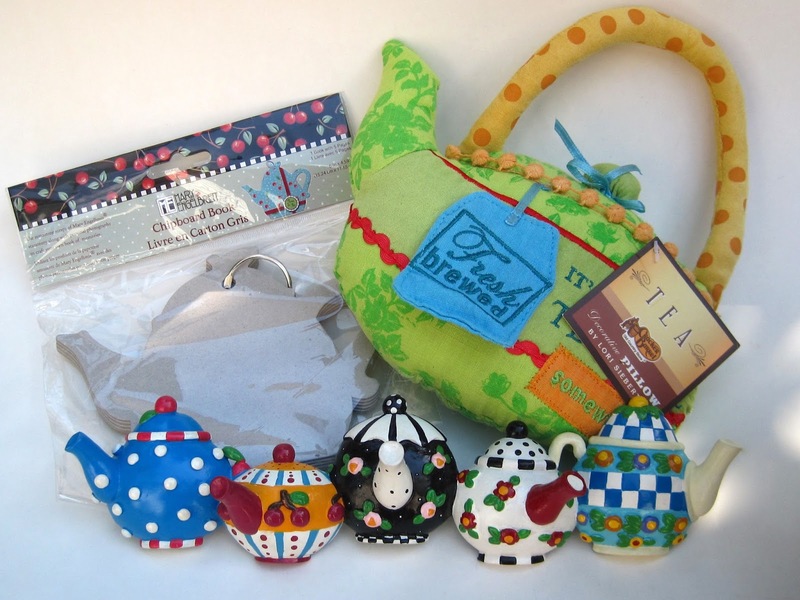 You know, we tea folks really ought to purchase stock in Mary Engelbreit, shouldn't we? A fellow tea blogger merely mentioned Mary the other day and off I went to Michaels, where I was soon plundering through those cheapie bins up front. 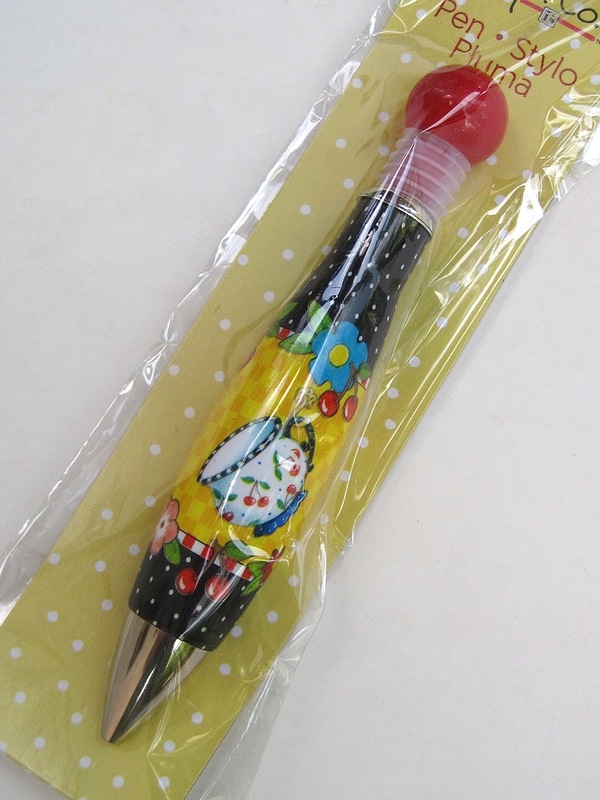 Among the happy designs I got this time was this fat little pen with a teacup on it. I already had the notecards with this design, but I hadn't seen the notepad. That was a must-have for me, the way I go through journals and notepads! 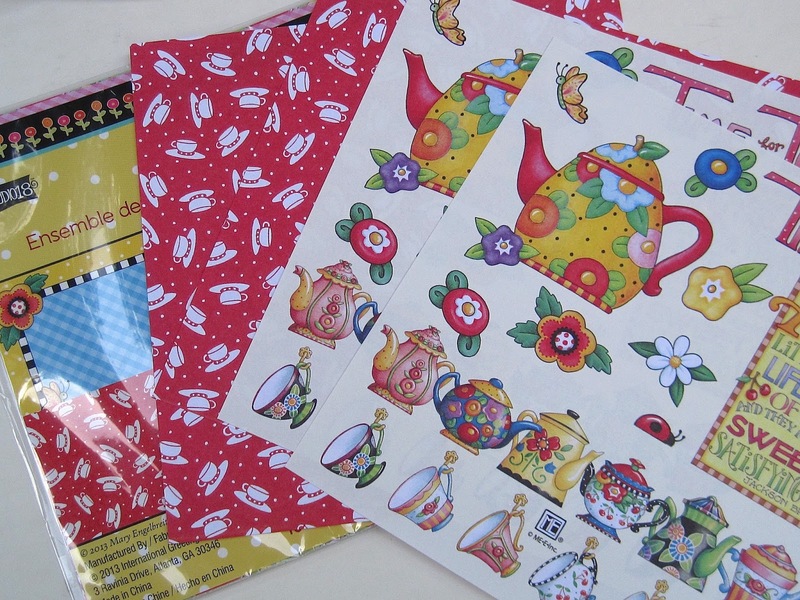 And finally, I picked up a couple of packs of these 6x6-inch scrapbooking papers because I especially liked the designs with teawares on them. 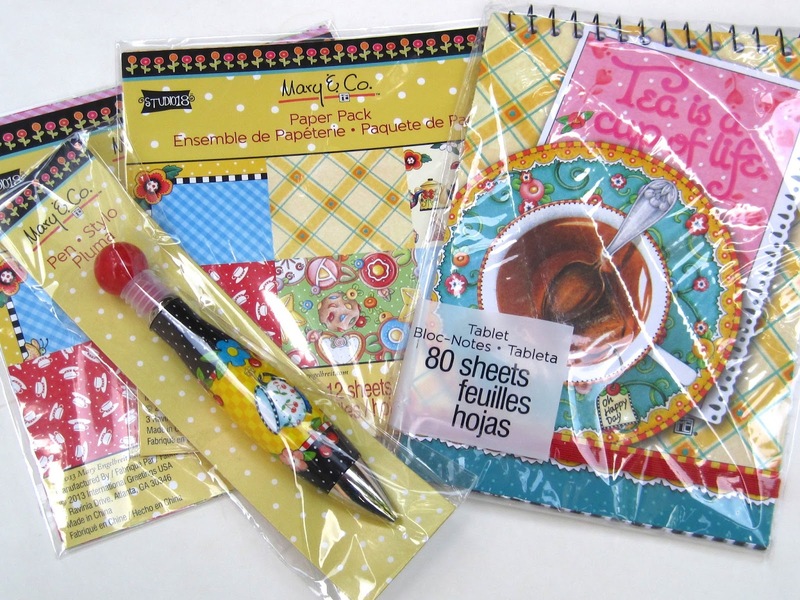 Have you found any new Mary Engelbreit goodies lately? Do share! 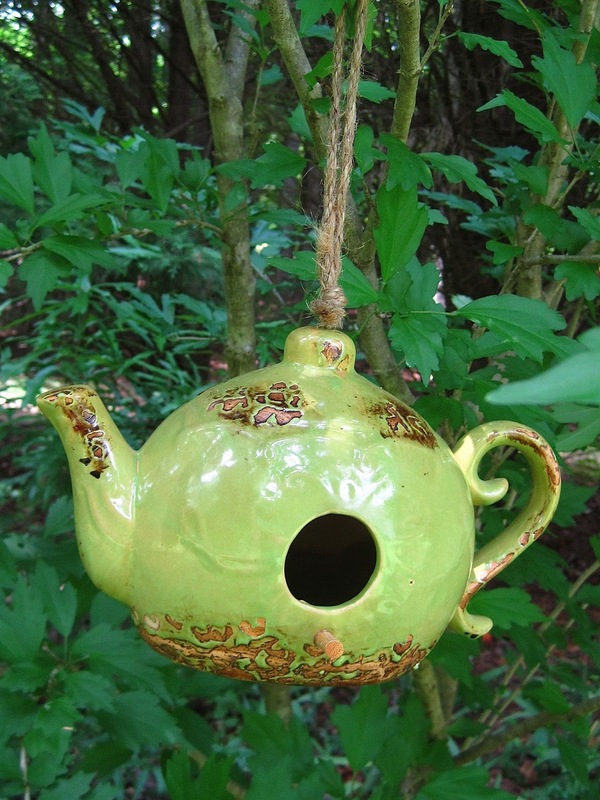 Not long after my birthday this year, a friend and I had lunch and she gave me a new goody for the garden, this pretty new green teapot-shaped birdhouse. I love it! 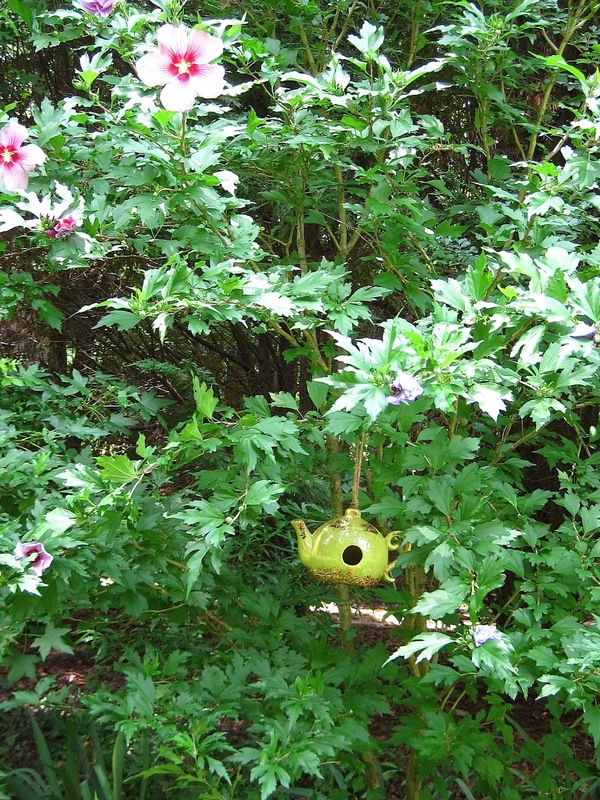 Now spring pretty much peaked in Georgia a while back, so I was hard-pressed to find a "pretty" spot for the new hanging birdhouse and finally decided on this hibiscus tree. We have white ones and lavender ones in our backyard, and I love to see them in bloom each year. I hope the birds enjoy hanging with the hibiscus too--and may they all be tea lovers! Jenny! If you'll send me your snail mail address via the e-mail button at right, I'll get this box of goodies headed your way. Congrats! 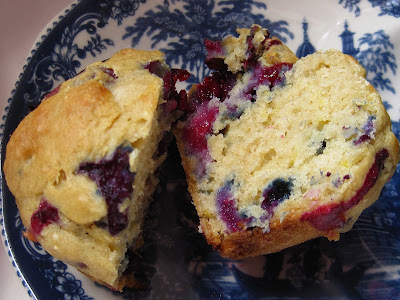 The blueberries have started coming in at my parents' house, so I used the ones I got there this weekend to experiment with a new muffin recipe! There are few summer treats I enjoy more than a baked good with hot, juicy blueberries drizzling down. 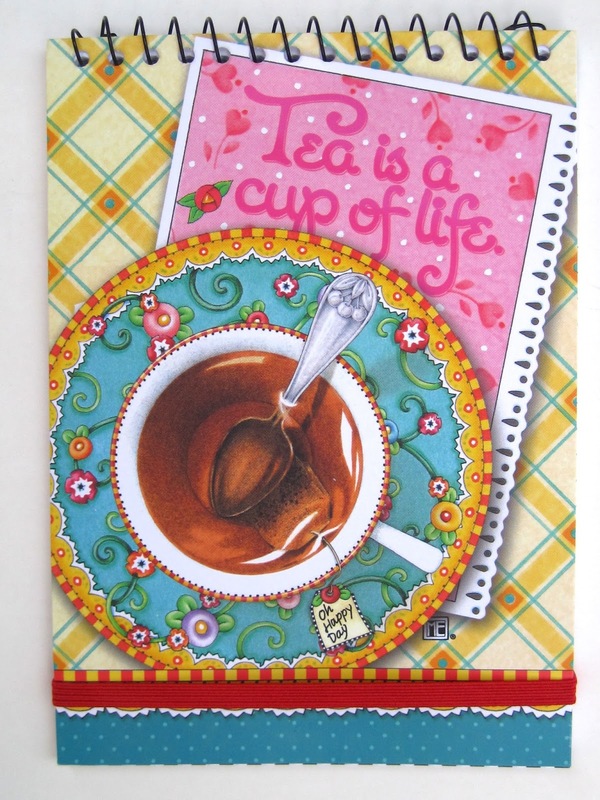 Yum, especially when served alongside a nice cup of green tea! 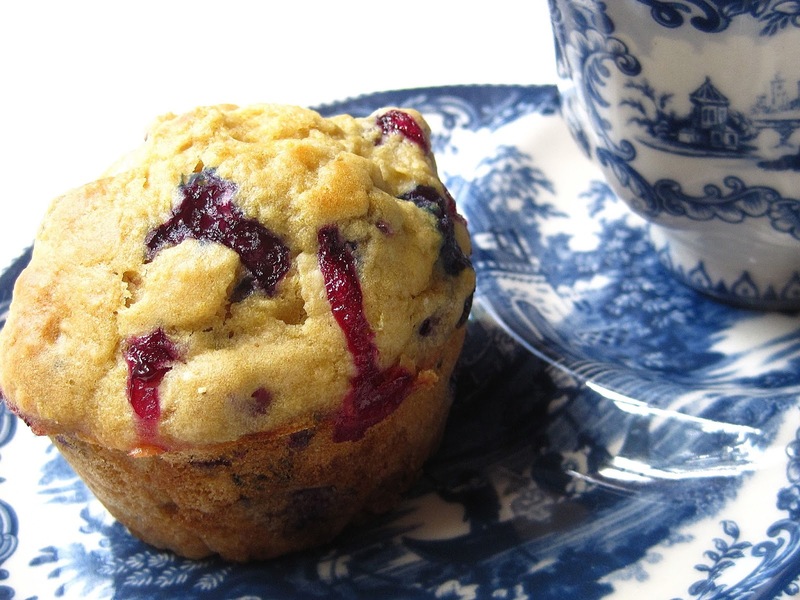 In an effort to bake healthier snacks, I had been researching muffin recipes made with applesauce rather than sugar and found one I tweaked a good bit. The result is these light, almost spongey muffins. Now both my husband and I *did* miss the sugar a little, but we also agreed this was a fine substitute sweet. (Then again, I'm from the South, so my blood type is A+ with a dash of sweet tea, y'know? It wouldn't kill me to lose some sugar in my diet.) 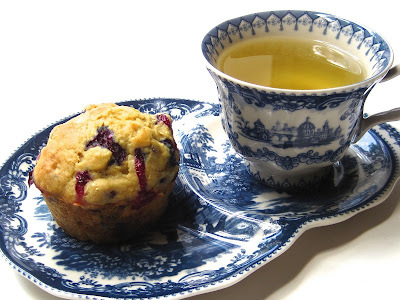 And because I knew I might miss the sugar, I compensated by overloading these muffins with fresh blueberries and lots of lemon zest, resulting in a tasty and quite satisfactory teatime snack. If you give them a try, I'd love to hear what you think! Preheat oven to 375 degrees and prepare a muffin pan with cooking spray. Combine egg, oil and applesauce. Add flour, baking soda and baking powder and mix well. Add lemon zest, lemon juice and blueberries. Mix just until combined. Spoon batter into muffin tins and bake for 20-25 minutes or until firm and slightly brown on top. Yields 1 dozen muffins. It's been more than a decade now, but I still have fond memories of the day my mom, aunt, sister, nieces and I visited the Chocolate Biscuit Tearoom in Trussville, Ala. This was more of a "ladies luncheon" place than a fancy afternoon tea kind of place, but the food was very good and we really enjoyed ourselves. 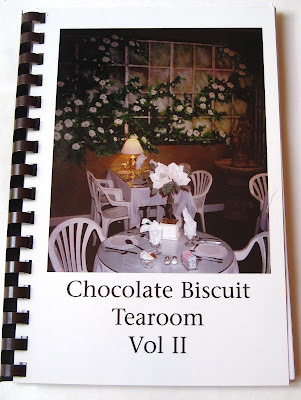 This week, I was pondering whether any of my tea room cookbooks might have a recipe that would use up some of the (treasured!) squash from my Daddy's garden. I had a feeling the Chocolate Biscuit cookbook might turn up a squash casserole recipe, and indeed it had several! This book, in fact, has recipes for *eight* squash casseroles, as well as squash croquettes and a squash souffle, so it looks like my squash-baking needs are good for a while! This tearoom, incidentally, is still in business and really did serve Chocolate Biscuits (biscuits with a rich chocolate sauce) the day I visited. They were great! 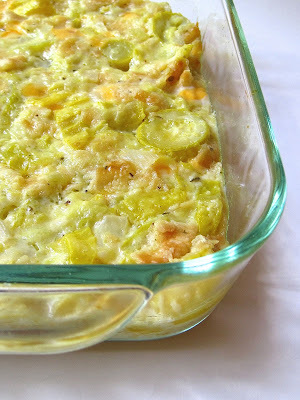 Now I've rarely met a squash casserole I didn't like because, really, you have to work pretty hard to mess this up. But this one called for a couple of ingredients I haven't used in such casseroles before, garlic salt and oregano. I must say I love the way these additions perked up this dish, one of my all-time favorite ways to eat vegetables. If you're a squash fan too, you just might want to give this a try! Preheat oven to 350 degrees. Drain the squash and onion and pour into a large bowl. Add remaining ingredients and combine well. Spoon into an 8 x 8-inch casserole dish prepared with cooking spray and bake for 25-30 minutes. Said to freeze well, but I can guarantee you that at my house there will be no leftovers to freeze! It's the first day of summer, and so some new tea blends are in order, don't you think? 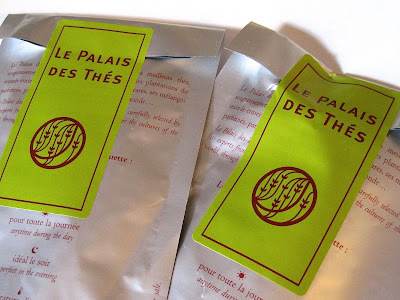 I decided to try some new samples I recently received from Le Palais des Thés. First, from their Les Plaisirs Purs line is this La Fleur d'Oranger tea. This Chinese green features the flavor of orange blossoms, and the scent that greeted me when I opened the packet was orange and some undefinable something that made me think of the beach. (Although, I should confess that *everything* makes me think of the beach in summer!) 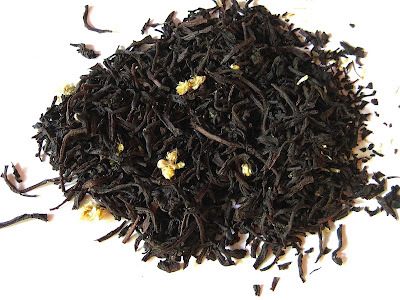 I prepared this as hot tea and enjoyed the subtle orange taste. I'm thinking I should probably try it iced as well. Le Citron is a black tea from Sri Lanka with lemon scents and natural flavors. When I opened the packet, I immediately thought of those lemon sour candies, so I knew a nice, lemony taste would probably await, and indeed it was a brisk, perky cup of tea, perfect for summer sipping. 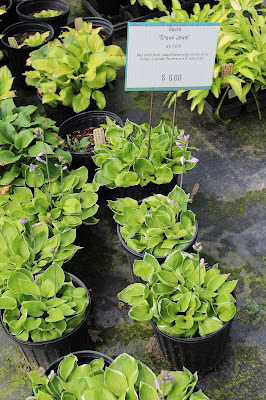 To see these and other Le Palais de Thés offerings, go here. I think I'm going to start calling this site "Tea With Friends: The blog that makes shopping mistakes so you don't have to!" 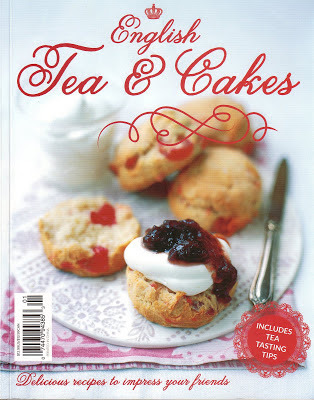 Actually, I'd be thrilled with my new $7.98 cookbook from Barnes & Noble, up top, which features more than 100 classic teatime recipes, if I hadn't recently bought its predecessor, this $12.99 magazine (which I wrote about here), which has just over 75 of the same recipes. Now why did a *book* with more recipes cost less than a *magazine* with fewer recipes? 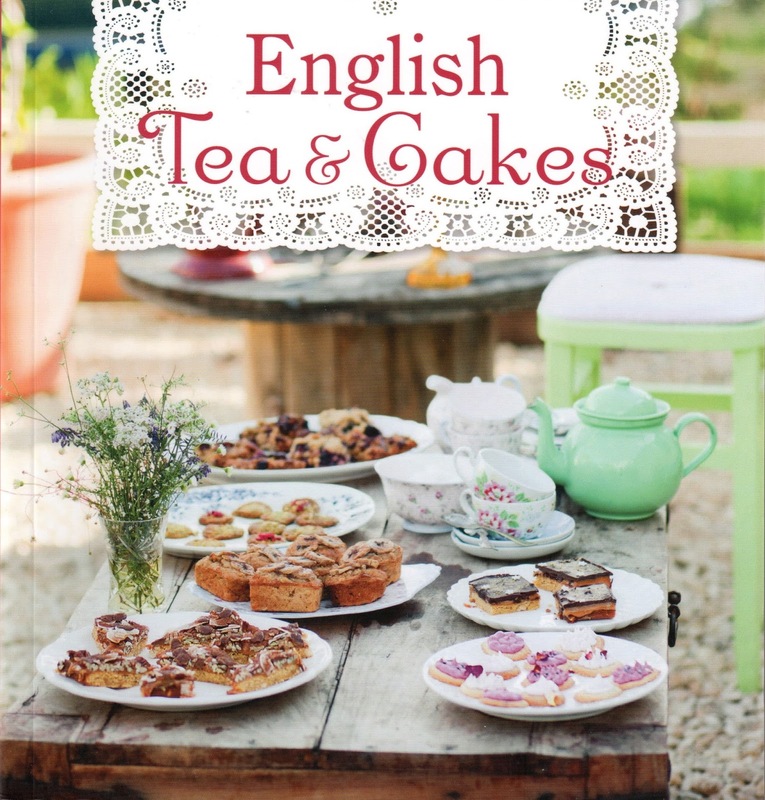 Ah, well, at least I did get a few new recipes, but I will perhaps restrain myself from buying future English tea magazines until I make sure Barnes & Noble isn't about to introduce a new book! One of my mom's recent yard sale finds was this pretty pink teacup, which I immediately loved when she passed it along! The color is perfect, the shape is attractive, and it's that larger size of teacup I so enjoy using when I sip tea. The roses on this set are just charming, I think. 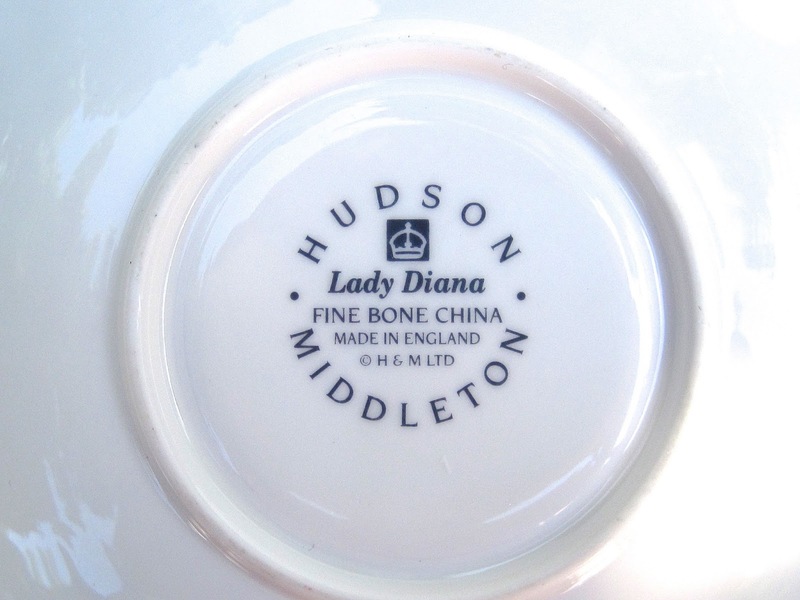 But I really loved knowing it's the Lady Diana teacup from Hudson & Middleton, a company in the UK! Mom says the lady at the yard sale told her it originally sold for $40. I didn't ask my mom what she paid, but I can guarantee you she didn't pay anywhere near that. What a fun new find, and it led me to the company's lovely website here. 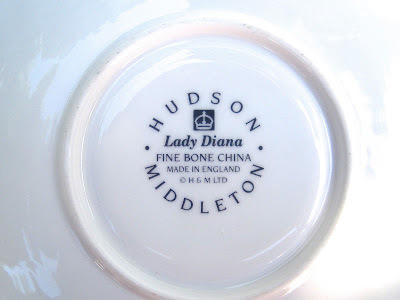 Do any of you have Hudson & Middleton wares? This was definitely a new name in teawares to me! 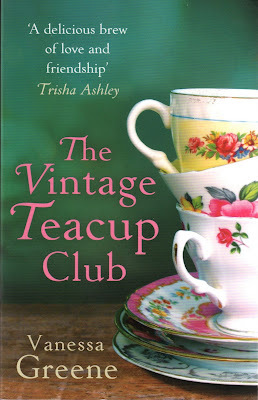 A while back I was searching for tea books on Amazon and came across a British title I thought would be fun to read, "The Vintage Teacup Club" by Vanessa Greene. 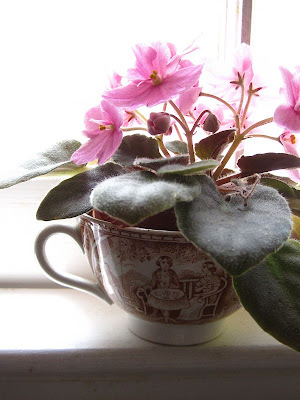 The story begins with three women reaching for the same tea set at a car boot sale. They decide to share the tea set and help each other find more teacups for all to use. Now, I have to confess to you that I just don't believe that would ever happen. 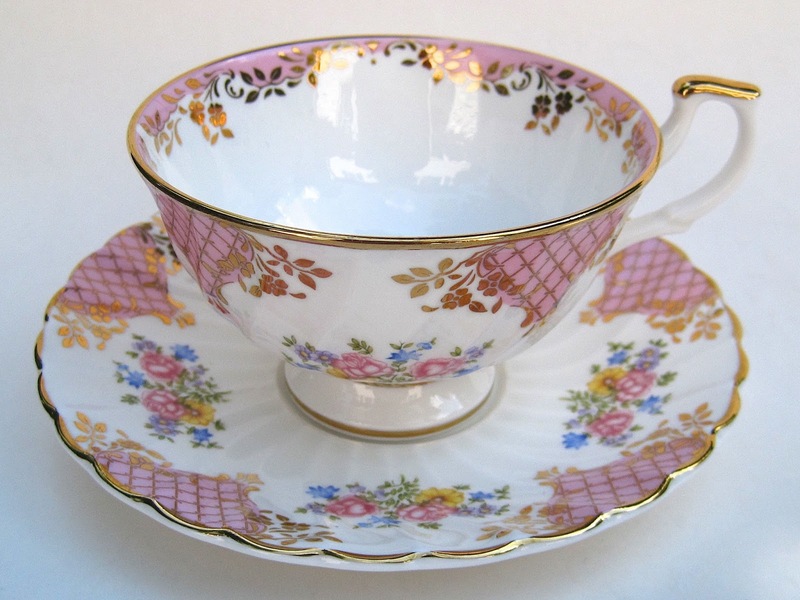 A) The first one to lay a hand on the tea set gets the tea set. B) If I found the tea set first but someone else *really* wanted it, I'd let them have it. (I think.) C) Three strangers are comfortable enough to trust each other with sharing a tea set? My inner skeptic says no. But once I got past that, I did find myself drawn into the plot. There's Jenny, who's planning to marry Dan. 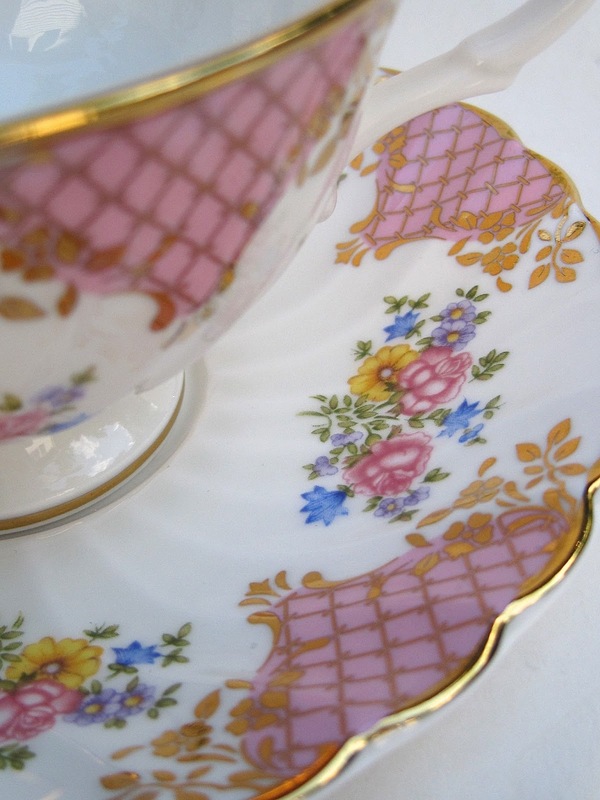 She wants the vintage teawares to use at her wedding. There's Maggie, a flower shop owner, who is young, divorced, and has landed a job doing the flowers at one of the biggest society weddings of the year. It's an "Alice in Wonderland" themed event, and she wants the teawares for that. And then there's Alison, who appears to be happily married, until she finds out her household situation is not as she has believed. She makes candles in vintage teacups, so that's why she wants them. 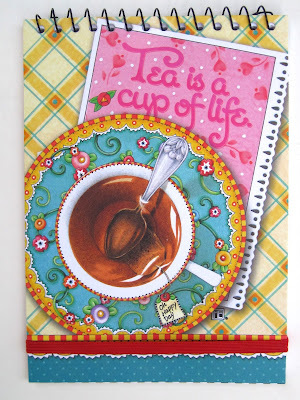 The women are quickly drawn into each other's lives, and over cups of tea, a bit of gossip, a few tears, and plenty of everyday stress, they become good friends. Along the way they meet a few other important characters, including the original owners of the teawares. The book's characters make some lifestyle choices I dislike (must young women nowadays instantly hop in the sack to get a fella? I say no—gals, you are worth so much more than that! ), but at least there is redemption in the form of a gracious older couple who've learned what matters most in life. Also, there's a heart-stopping scene near the end of the book that will shake the soul of every teacup collector. 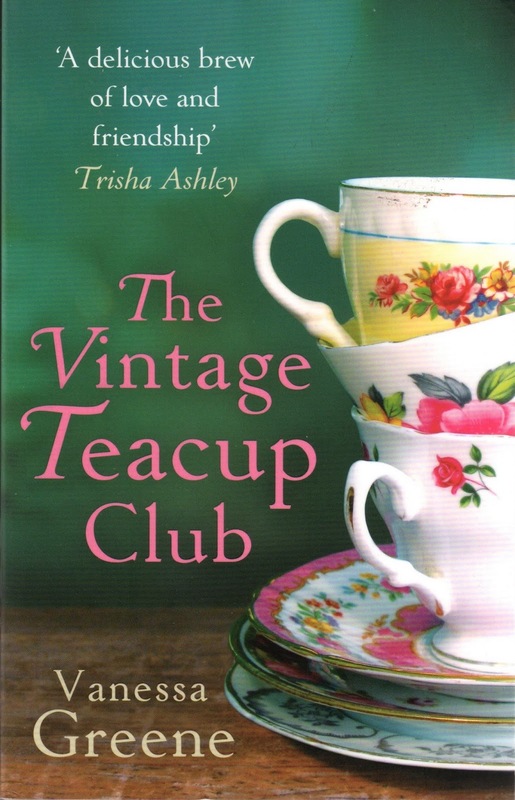 By the time the story wrapped up I was rooting for all three women and even believed in their teaset-prompted friendships. Have any of you read this book? I'd love to hear what others thought! I really need to clean out my crafts closet more often. In a bag there, I found several items I had tucked away for future giveaways, so I decided this week would be a nice time to give them all away! The winner will get the goodies shown here PLUS some tea samples and a few other small doodads as well--whatever I can stuff into the box. First, there's a little teapot pillow from Cracker Barrel. These are so cute! 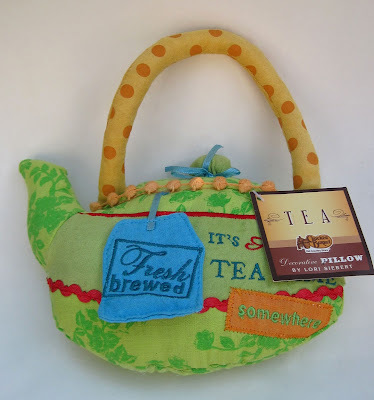 And last but not least, there's a little Mary Engelbreit teapot rack that needs a good home. 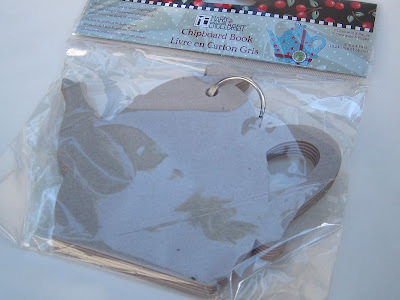 It's small, just about 11 inches wide. It hangs by these hooks on the back. Could you find a spot for it? If so, just leave a comment to this post between now and 7 a.m. next Monday, June 24, and all these teatime treats can be yours. (U.S. and Canada only, please.) Good luck! 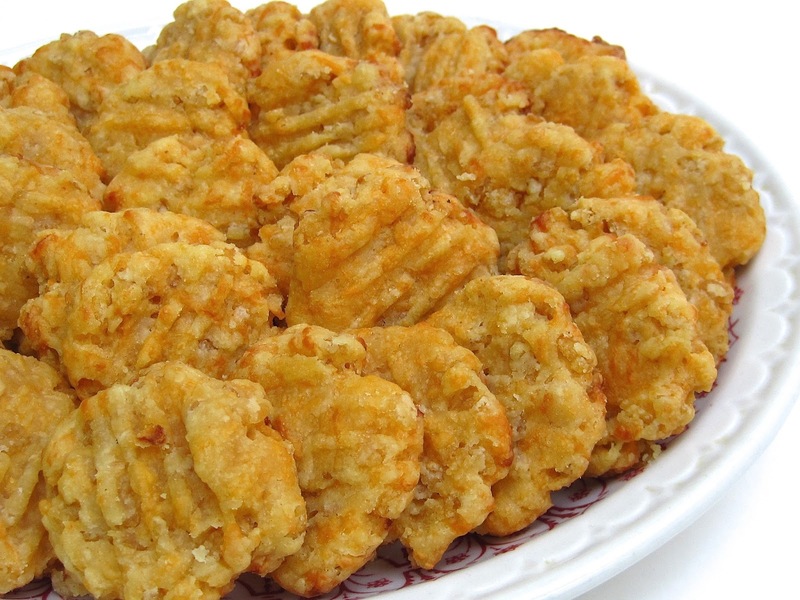 Consider the humble cheese straw. Do you like to eat them? Do you like to make them? I've rarely met a cheese straw I didn't like, and I associate them with three particular occasions: 1) southern weddings before, oh, the 1990s or so 2) bridal and baby showers 3) tea room luncheons. I was watching TV the other morning when a psychologist was asked his opinion of a recent bride who is experiencing depression now that her big, honkin' hoopla of a wedding is over with. That kind of thing just makes me roll my eyes, and as I told my husband, I think things were better back during those simpler times when weddings (here in the South, at least) meant wedding cake, party mints and cheese straws. 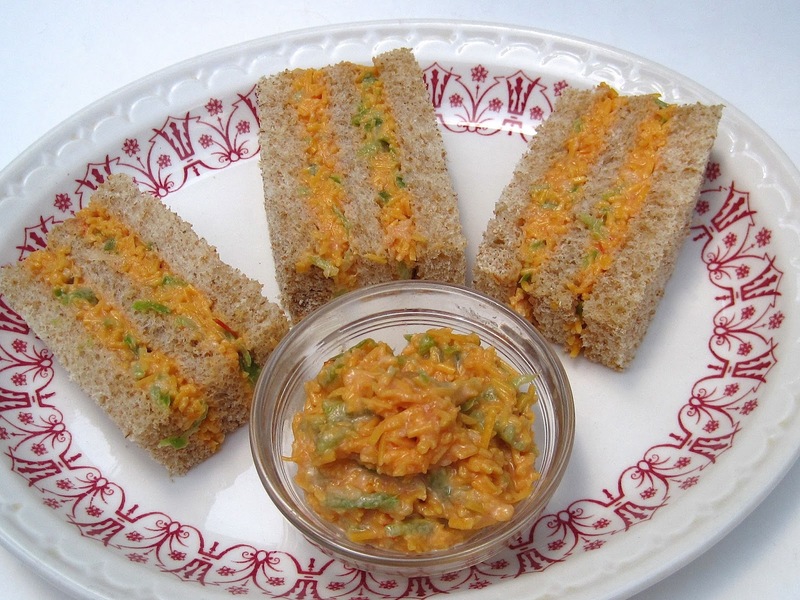 (OK, and crustless, triangular pimiento cheese finger sandwiches if you wanted to go *really* fancy.) 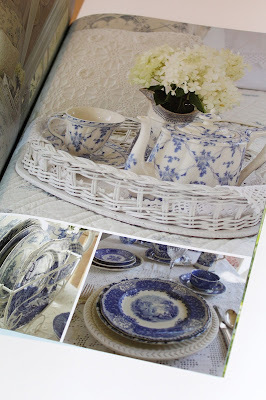 So maybe that's one reason I had cheese straws on the brain when I flipped through a tea room cookbook the other night. "Kitchen Delights from Then and Now" is a book of "treasured recipes" from the Fort House Tea Room and the Friends of Historic Waco Foundation. 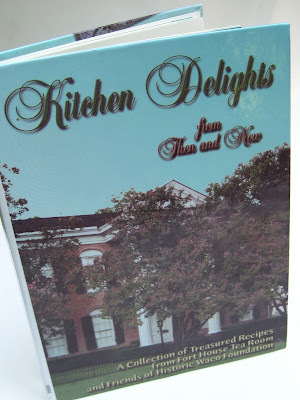 There are many tasty-sounding recipes in this book, and I love the fact that actual Fort House Tea Room recipes in the book are denoted by a teapot icon. Cute! The recipe for Nell's Cheese Wafers (which are basically round cheese straws) sounded fun and easy, two qualities I like in a recipe. 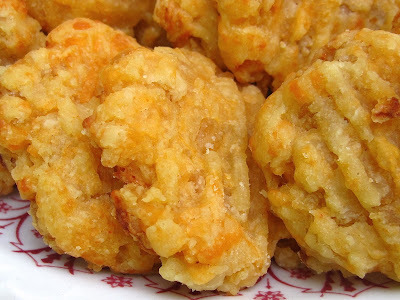 When I made these, my husband commented on how he enjoyed the crispy texture. I asked if he could guess the magic ingredient that made them crispy, and he could not. Can you? 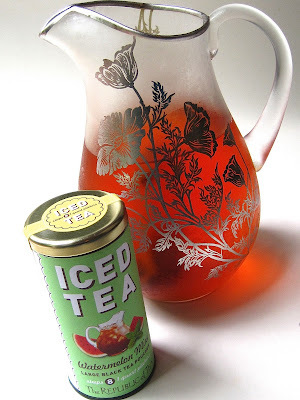 June is National Iced Tea Month, and if you're looking for a new iced tea blend to try, I've got one: this Republic of Tea Watermelon Mint flavor I found at Whole Foods. 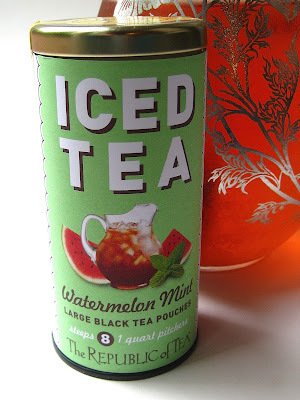 I couldn't quite imagine what a combination of watermelon, peppermint and tea would taste like, but I was intrigued enough to try it. 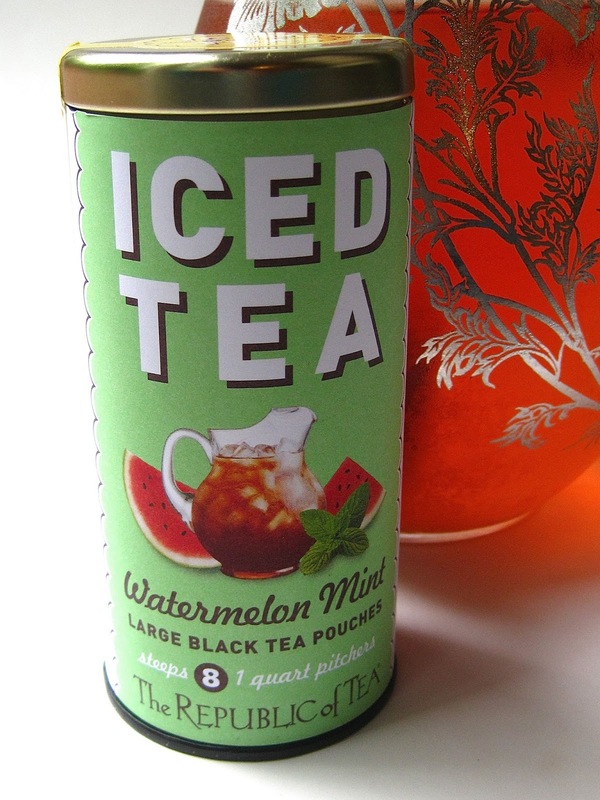 This black tea blend is just a cool, refreshing taste with what I'd call a suggestion of watermelon and a hint of peppermint. It's really a most subtle flavor, yet very nice. I don't think I'd up either flavor if I could! The tea comes in 8 (1-quart) pouches, which we are instructed to steep for 3-5 minutes, let cool and serve over ice. I don't do that. 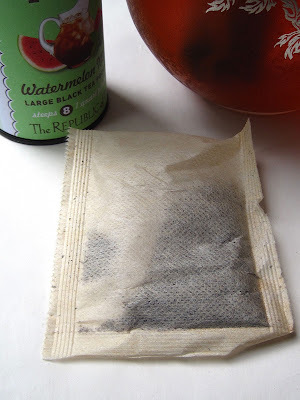 I plop a bag in my tea pitcher, fill it with water, leave it in the fridge overnight and I have delicious tea the next morning! One of the things that's most enjoyable about reading other blogs is coming across information that you wouldn't find any other place. I've learned lots of things (about LOTS of things!) 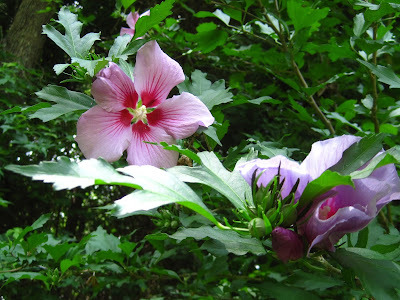 from reading Judith's blog, Lavender Cottage, and recently she mentioned a new book by her fellow Canadian, Carolyn Aiken. I knew that if Judith liked the book I would as well, so I followed her link and was just smitten with what I saw. 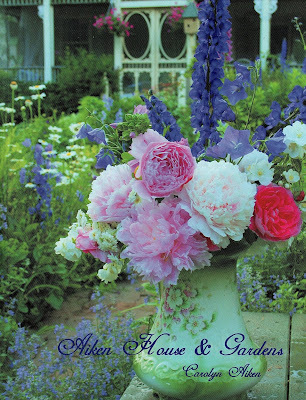 It was self-published by this lovely woman who, when the last of her seven children left home, had more time to devote to gardening at her home on Prince Edward Island. She is obviously a dedicated gardener, and it is so inspiring to see how she has planted and decorated her gardens! This book is what publishers these days are calling a "bookazine," a sort of book and magazine hybrid. 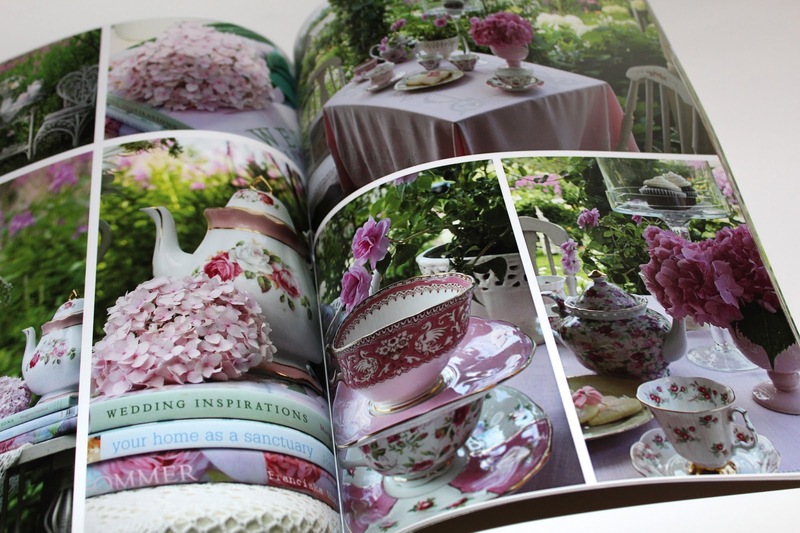 It's the size of a magazine and printed on good, thick stock (82 pages), largely photographs, but even the small amount of text is simply charming. As you would expect of someone who lives on PEI, there are a few "Anne of Green Gables" quotes, but the eye candy is what has entertained me for several hours with this book. If you're a fan of roses and peonies and lilacs, or old lace, or pastel-hued teawares, well then, Carolyn Aiken is someone you ought to know. This book strikes me as a very personal work, almost a visual diary of her style, and I love that she has published it for others to share and enjoy. She blogs here, if you'd like to get a taste of what she has in store for readers in the book. There's even a bit of blue and white for those who are fans of that palette. I just adore my copy of this book, and I'm patting myself on the back for reading Judith's blog regularly so I won't miss out on such things. If you think you'd like a copy as well, go here to order. 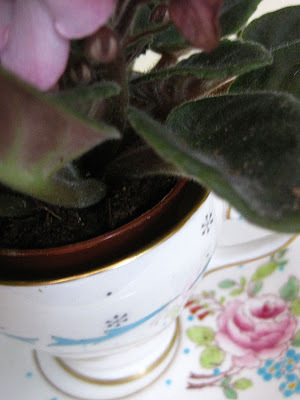 Earlier this year my friend Deberah gave me this miniature African violet, which got me on another round of trying to grow them. I finally followed some friends' advice to use African violet fertilizer, and that seems to be working! Encouraged, I picked up a few more of the little plants at a local nursery the other day. 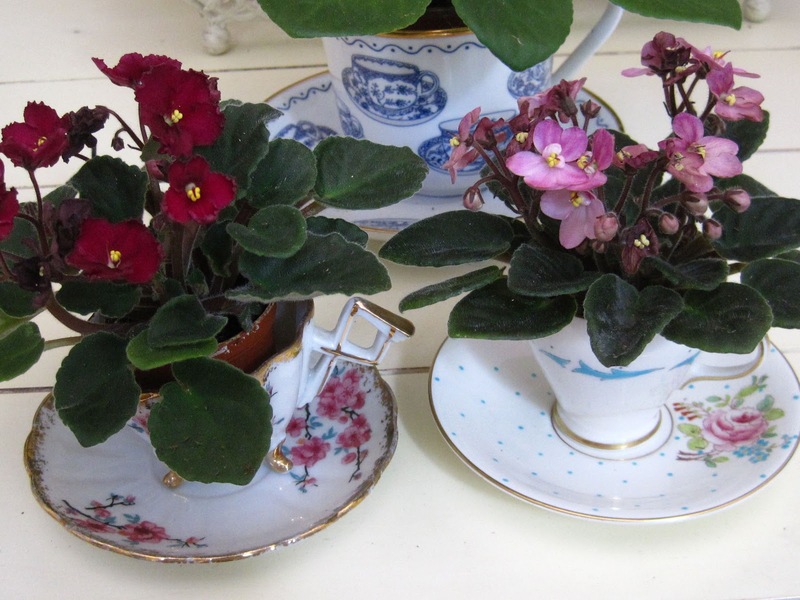 Some of you had asked whether I place the violets directly in the demitasse cups or have them in another pot, and I wanted you to see that I do keep them in their original tiny pots so I can water them when needed (letting them soak up water from the bottom) and drain off the water after a bit, since apparently violet roots do not like to be waterlogged. I think the new violets are rather adorable in their tiny teacup homes! 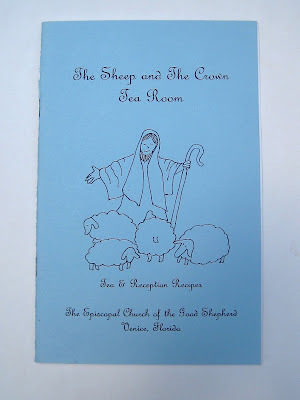 A most memorable tea room visit! This is not my usual sort of post, friends, but I hope some of you will find it humorous! You see, I've been cleaning out lots of old files lately, and I came across the poem I wrote following a particularly memorable teatime birthday luncheon with some girlfriends years ago. (Yearrrrrrrs ago. I'm 49 now, and this was the year I turned 31!) My friends Liz and Melissa, along with Melissa's baby daughter Elizabeth, took me to tea at a nearby tea room, which shall remain nameless. We had a lovely time until the end of our meal when Liz bit into her dessert, an ice cream and nut concoction called "Mackinac Delight," and promptly chomped down on a big piece of broken glass (probably from the jar containing the dessert's sauce, we later learned)! There was so much blood it took all our napkins to sop it up, and the nervous tea room owner even offered to call an ambulance! Liz recovered, by the way, and no, she didn't file a lawsuit. A simple meal, a birthday treat! as we considered proper there. I was the one to order first. wishing we had diamond rings. and hoped it would be very good. but with dessert would come the test! the name alone says why, of course. the list of desserts continued to grow. This dessert would leave her reeling. The menu said "Mackinac Delight"
and Liz thought this would be just right. And said to enjoy our dessert game. so all could sample the lovely fare. But something was wrong with Liz's plate. she cried aloud, "My tongue is bleeding!" the correct response we did not know. that Liz had somehow eaten glass! while watching Liz's tongue's blood spurt. "Ith OK," said my nurturing friend. "Reary, thith ith not the end." Too bad about the ice cream's crunch. When my garden club visited a local hosta grower recently, I was hoping-hoping-hoping I'd go home with a tea-themed hosta, and I did: the charming 'Tea and Crumpets' hosta! 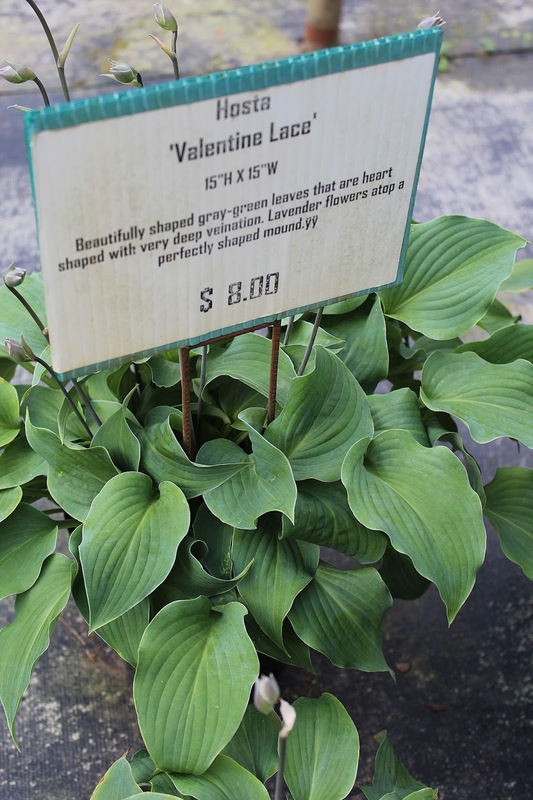 This little sign tells more about the hosta, including the fact it has spoon-shaped leaves. 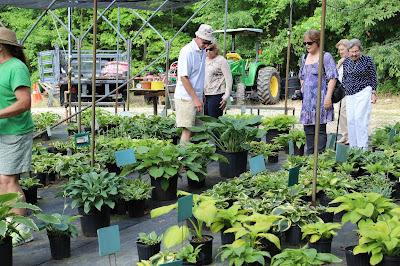 It was so much fun when members of our Crossroads Garden Club visited Pine Forest Gardens in Tyrone. 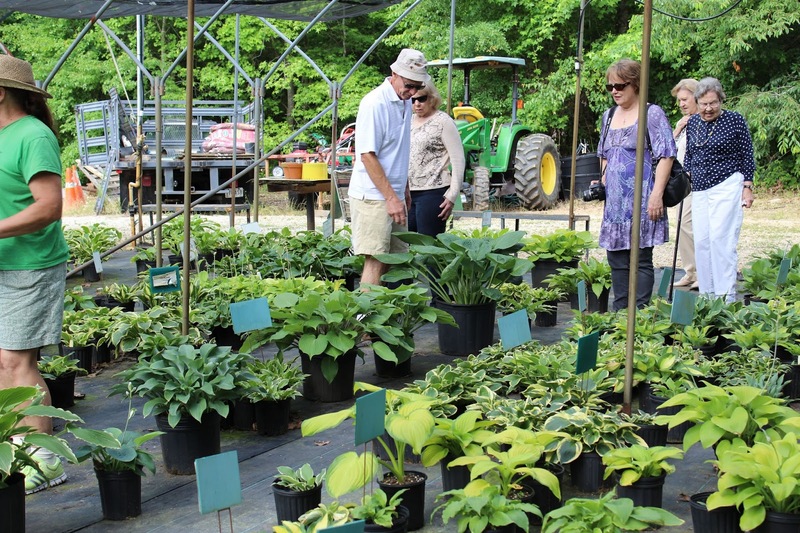 Owner Richard Jolly, center, was recently a guest speaker at our club, so it was fun to follow up his educational presentation with a visit to the amazing site where he actually grows his hostas. Here's our club's secretary/treasurer, Wilma, checking out the hostas. 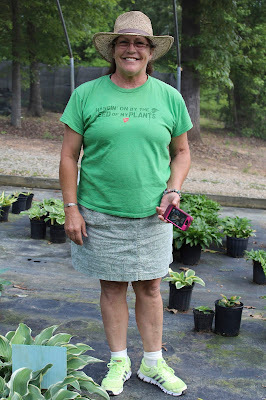 I love her t-shirt: "Hangin' on by the seed of my plants." Cute! 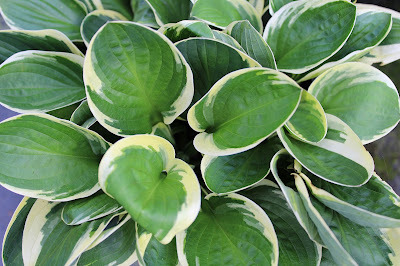 There were so many colors, shapes and sizes of hosta, and I had no idea so many existed. There were miniatures (under 12 inches tall), some in lime green, some dark green, ruffled ones, piecrust-edge ones, variegated ones, and some that are considered "blue" because of the appearance of the waxy coating of the leaf. 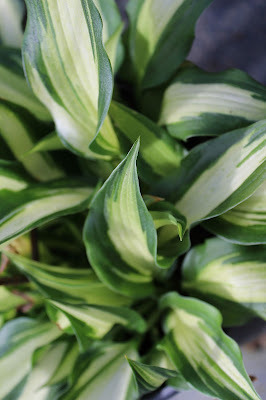 Of course I always have to like the name and/or meaning of a plant as well, so it's no surprise I also came home with this small 'Crown Jewel' hosta. A larger hosta with a similar name was the 'Royal Standard' hosta. I'll bet someone out there has a royalty-themed garden, or at least a section of a garden, don't you? 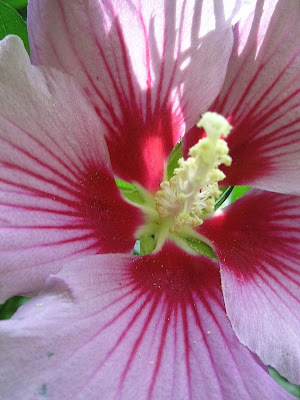 And this one was 'Valentine Lace.' Isn't that lovely? 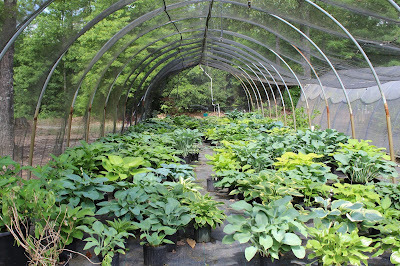 Richard even permitted us to go into the greenhouse where his private stash of hostas is located. 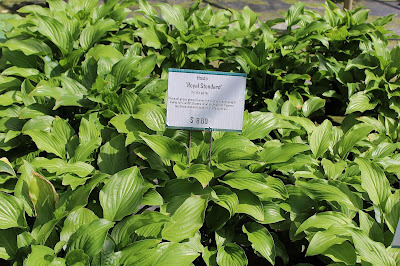 All of us garden club members left Pine Forest Gardens with new plants, and it was so fun to get to see so many of these great hostas all in one place. 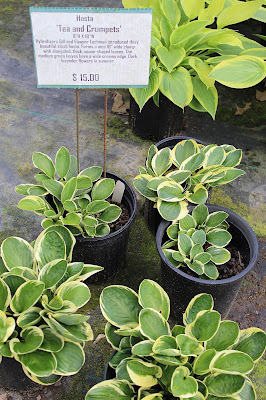 If you happen to be a hosta lover too, I should mention that Richard ships plants all over the world, and his website is here. 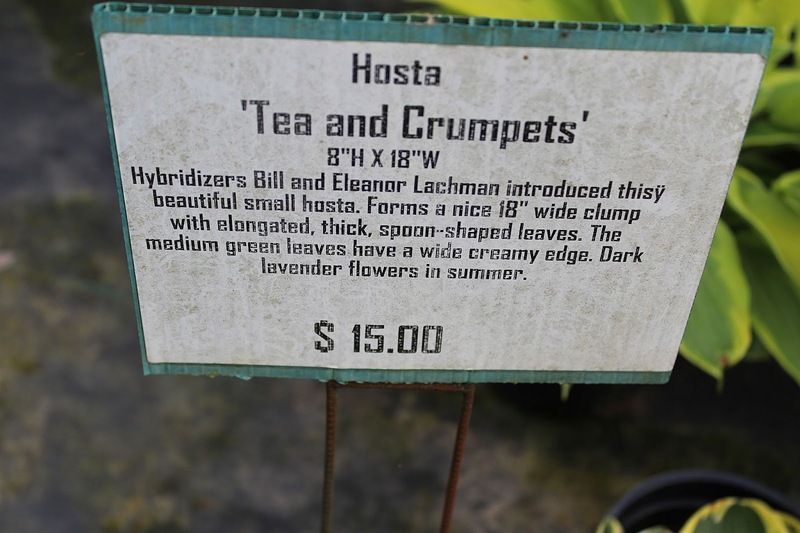 And now I can't wait to see my new 'Tea and Crumpets' flourish!